Can a Christian Participate in Paganism? If you're looking for extensive information on the pagan origins of Halloween you're in the wrong place. I'm working off the correct assumption that the holiday itself is a pagan festival. Halloween literally means "All Hallows Evening" and represents the day in which the separation between the spirit and physical worlds is the thinnest. Each practice has spiritual significance. The costumes are for the purpose of confusing dead acquaintances who might want to enact vengeance on you for a wrong you did them while they were still alive. The "Trick or Treating" is meant to appease the evil spirits so they won't carry out wicked plans on your living quarters. Just about every aspect has some kind of pagan significance. Assuming this to be true, how should a Christian react? Should we participate? After all, the Christmas tree also has pagan origins, yet we use that all the time? Should we substitute our celebration of Halloween with the celebration of "Reformation Day?" In America, it's hard to approach this question. In other countries I suspect it would incredibly easy simply because they take it seriously. In Mexico they actually think dead people are truly walking around, and they practice Halloween out of complete fear. However, here in America, we've learned to take every holiday and completely commercialize it. Halloween is no exception. In the 1960s when my parents were young, it was really just a day to have a costume party and eat candy. The spiritual significance was not understood or taken seriously by the general public. However, today the pagan aspects are starting to surface again. Is the holiday still about innocent costume parties and getting cavities, or is it about something deeper? I tend to think the costumes themselves are indicating a pagan shift in this direction. No longer do the little girls want to be the princesses. No longer do the little boys want to be the astronauts. The consumes are now typically demonic looking. People dress up as Freddy Krueger, Ghosts (not the white sheet versions), zombies, skeletons, warlocks, wizards, etc. And the costumes which aren't "scary" tend to be extremely provocative. I'd like to take you with me to two completely different situations. Situation #1 is a "costume party" sponsored by a boy scout troop. Situation #2 is a "day of the dead" seance and game night at someones home. Both parties have bobbing for apples and candy (party #2 has alcohol as well), however the purpose of each is very different. Yes, both sets of attendees are looking for fun, however the second set are embracing the pagan version of Halloween, while the first set is simply using a couple of its elements to do something completely different. The motivations are different. Now if you as a Christian were invited to each, what would you do? Would it be a sin to attend the first one? How about the second? Really the question which needs to be answered is, "Am I putting my stamp of approval on paganism?" If you are, then it's clear what you should do, because to do otherwise would be a violation of conscience as you would be committing idolatry. Romans 14 is really the passage to be looking at. A Christian is not supposed to participate in activities with which he or she is uncomfortable. It's obvious that getting drunk and participating in a seance at party #2 is completely wrong because you'd be directly violating two commands of Scripture, but what if you were just present while others were participating in those activities? Are you giving them approval and sacrificing your testimony? I believe this is the difference between going to a non-Christian religious institution and participating in the ceremonies as opposed to merely being an observer. We'll pick on the Mormons for a minute, because I attended a Mormon church once for educational purposes. I sat in the back, didn't sing the hymns, didn't participate in the prayers, but simply observed. But if I were to go up to the front and give my testimony, or partake of communion, etc. I would be directly participating with them and giving them my approval. The same I believe can be said of Halloween party #1. Can you go? Yes, I suppose. You could even go dressed as Moses with the Ten Commandments (talk about scary!) and not participate in the pagan-motivated practices. But you have to ask yourself, what would be the point? The purpose of the party is to have a seance and play the Ouija Board. If you aren't doing those things, why are you there? Scripture warns of the appearance of evil. 1 Thessalonians instructs, "abstain from every form of evil." For the people present we must remember 2 Cor. 8:20-21 which states, "taking precaution that no one should discredit us in our administration of this generous gift; for we have regard for what is honorable, not only in the sight of the Lord, but also in the sight of men." In other words, Paul was concerned what men would think of the Gospel, because he was a living testimony of it. He did nothing to "discredit" his witness.Would you be discrediting your witness by attending a Halloween party? These are questions you can only answer yourself. I tend to think it's very unlikely that with a clean conscience, and without discrediting your witness, you can attend, and have fun at a party in which the name of your God is pretty much being trashed in favor of the demonic. Let's consider party #1. There are practices that have a pagan history (like the Christmas tree), but they're being practiced in a very non-pagan way and with non-pagan motivations. Would it be alright for you to go to a costume party? I tend to think it would be fine, so long as your conscience is not violated by doing so (if it is, then no you shouldn't). What you're really doing is participating in a dress-up party which happens to use Halloween as the excuse for which to merit the occasion. Halloween itself however, is not really being celebrated. I hope perhaps these questions will help some of the struggling Christians out there know better how to approach the question of Halloween. I grew up in a family in which we had "harvest parties" and sometimes "costume parties" at church youth organizations. One of my brothers went trick or treating once, but I confess I never have. Since I don't have much of a sweet tooth its not too tempting for me anyways. But I do realize, many of you have grown up doing trick or treating and all that comes with it. I don't think any of it's wrong (in fact, the major reason my family didn't participate was because of the sick people who put razor blades and poisons in candy), but I do have some pause about it. I'm very concerned about the appearance of evil. Just how far can you go? The Bible isn't crystal clear on this matter, and it's really up to our ourselves to rightly apply the Biblical principles. To recap: Here are the questions you need to ask yourself before participating in a Halloween event. Will it force me to compromise my beliefs by participating in actual pagan practices for pagan reasons? Will it cause another Christian to stumble and use your example to violate their own conscience? Will it compromise the Gospel to non-Christians? Would you invite Jesus to come with you? Is it a profitable use of your time? Will it violate your conscience? What's that sound? Oh, it is just the sound of all the fun being sucked out of being a kid today by adults who don't used an occasion like Halloween to help them learn and make good choices. Also, the razor blades and poison were just urban legends, no real truth. Snopes would disagree with you. There have been documented cases of both poisons and sharp objects inserted into candy and given away to Trick or Treaters. Also, you have to remember, fun is what you make it. 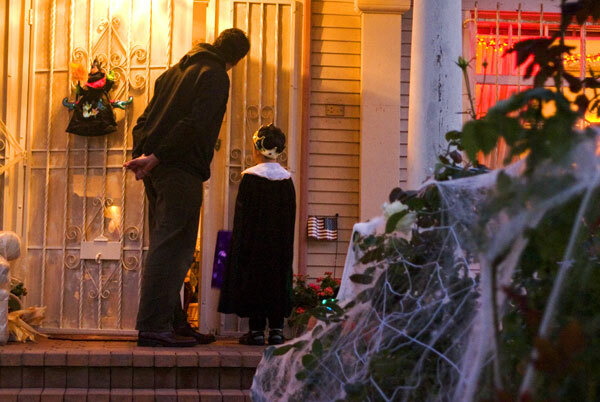 Others may have fond memories of Halloween as a child (the anticipation, the candy, the dress up). But I have have fond memories of my family's harvest parties and costume contests at my church. I also grew up not believing in Santa Claus, but Christmas's were still amazing as a youngster. I'm pro-fun, it just needs to be morally right and I haven't said whether Halloween is or isn't. AMEN! Great dissertation on Halloween. We were just covering Romans 14 ON Halloween Sunday-- (ironic, eh?) and while our church in general celebrates Reformation Day I appreciate your way of talking about our witness and different people's conscience when it comes to doing non-inherently evil acts.